With a full range of options and accessories TechnoChair is the most comprehensive range of industrial and technical seating available. A high efficiency particle filter is fitted as standard you’re all sterile and ESD clean room chairs. European Standard EN143 & International Standard ISO14644 Part 1-Class 4 Compliant. The working requirements of industrial and technical environments introduce specific demands that are not often encountered in the office. Seating in these environments must not introduce hazards to the safety of the people or the working process. There is a need to ensure good ergonomic adjustment and support for the operator for industrial and technical applications. 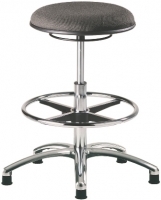 TechnoChair seating incorporates a build standard that satisfies the needs of function, adjustment and comfort. Every component and design feature adds value and can be configured differently to suit the specific requirements of a wide spectrum of specialised applications. With a full range of options and accessories TechnoChair is the most comprehensive range of industrial and technical seating available. Whatever the requirement, TechnoChair offers the optimum solution. Safety at work is paramount! 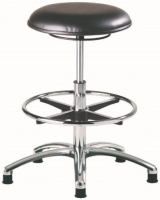 Free wheeling castorsoften present a safety hazard on hard floor surfaces and should only be considered for low height chairs on carpeted flooring. 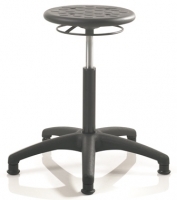 Low height chairs are fitted with ‘brake unloaded soft wheel castors’ as standard although glides are available. High and intermediate chairs are fitted with glides as standard. Note: responsibility is not accepted for injuries resulting from high and intermediate chairs where castors have been specified.